 Home  How to get AdSense approval in 2019?  How to! 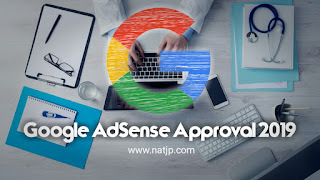  Technology  Tips & Tricks  How to get AdSense approval in 2019? How to get AdSense approval in 2019? - If you have a website or blog and you want to make money from Blog or website. So, you have to get approval from Google AdSense to earn money. Hi Friends, Today We will discuss How to get AdSense approval? I know that It is the first choice for every person who wants to earn money from their website or blog because Google AdSense is a trusted source to earn money. But, It is not easy to get approval from Google AdSense. Many New bloggers lose hope to get AdSense Approval and After few months, They quit blogging. I am also a blogger. My blog is rejected by Google AdSense more than 10 Times. Really? Yes, But, I did not lose my hope and work on my blog to make it more perfect. After 2 Weeks, My Blog got approval from Google AdSense. So, This is my story. If you have a real story like this. So, Please comment down below. Many bloggers read your comment and Motivate themselves. Now, Let's come to our main topic, How to get AdSense Approval in 2019? First of all, I want to clear some doubts. There is no minimum traffic requirement to get AdSense approval and you can earn money from every country views, If the CPC of Ads is good. So Friends, Follow these steps to get AdSense approval in 2019. Also Read - How to Get AdSense Account Approved for Blogspot? Before starting, you have to buy a custom domain for your blog or website. It is very easy to buy and connect domains. I recommend you to buy a domain from Namecheap and Bigrock. It offers domain names at a cheap price. So, you can buy a custom domain from here. Before Approval, Use a simple theme to get AdSense Approval. You do not need a very Stylish theme because it slows down your blog speed. After Approval, you can change your theme and choose a good looking for your blog. Sometimes, Many New bloggers submit their blog to Google AdSense for approval but, they get rejected. Because After writing 5-6 Post they submit their post to Google AdSense. So, Write More than 20 Post on your blog and then submit to Google AdSense. Google loves Unique content. It is not only to get AdSense Approval. Also, you will get Top ranking on Google with right keyword research. If you write more than 500+ words. Chances of getting approval from Google AdSense increased by 70%. Also, Don't copy and spin articles from other blog or website. If you are using images from Google. So, Remove them! This images may be copyrighted and you will not get approval, If you are using Copyrighted images on your blog. Where will I get Copyrighted Free Images? It is very easy to find free Royal images from the internet. Many websites and images are available online like Pixabay which offer free images. You can use these images on your blog. I also use many images from Pixabay for my blog. PUBG mobile snow map- Download Now! 7. Remove Third Party Ads. If you are using Third-Party Ads like PopAds, Media.net, Infolink etc. If you are using a Third-Party Ads network, Remove them temporarily from every page. Do not submit, your AdSense application before removing Other Ads network. Never use your Google AdSense Ads with PopAds. But, you can use Media.net with Google Adsense. Now, Your blog or website is ready to get approval from Google AdSense. If you follow every step, I bet you definitely get approval. Also Read- How do I get Adsense approval with a blogspot blog? This is my experience, I also get Approval from Google AdSense by following these steps. This is my Top 7 Tips for you to get approval from AdSense.